President Adama Barrow of Gambia has pledged to ensure the smooth transfer of power to his successor when his tenure as president elapses. 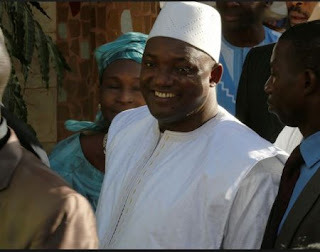 Mr. Barrow in an interview with the Nigeria Television Authority, NTA, on Sunday night also explained why he allowed the former President, Yahya Jammeh o leave the tiny West African country. He said his government decided to allow Mr. Jammeh leave the country, in order to ensure his (Jammeh’s) safety. “We don’t want him to stay in the Gambia, because we cannot guarantee his security. The security situation in the Gambia is fragile. It’s a very difficult situation. And if you allow a former President to stay in your country, you have to guarantee his security. Mr. Jammeh, who had led the country for more than 22 years, defied efforts by ECOWAS leaders to get him to step down from office having lost the presidential election. He disputed the elections a few days after he initially conceded defeat, citing widespread irregularities.